Llamawerx and Richard Rex proudly announce the launch of The Chisel Doctor. This unique tool enables woodworkers to quickly and easily sharpen their wood chisels, hand planes and spokeshaves in seconds. Using plain-old-sandpaper, The Chisel Doctor hones and grinds your blade to the optimum angle. That’s right, sandpaper. You can throw out your stones! The Chisel Doctor is a rock-solid, steel frame jig designed to firmly hold the blade in place. No guessing – just clamp the blade in and the angle is set. 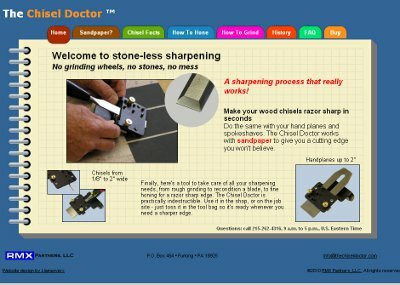 If you’re interested in trying a new sharpening tool that will save you time, money and heartache, visit www.thechiseldoctor.com and buy one today.